Flooring America of Seattle has been a family owned and operated local business for nearly 25 years. Some of the store’s early commercial projects included the iconic downtown Seattle Public Library, as well as hotels, airport terminals, and area retirement centers. 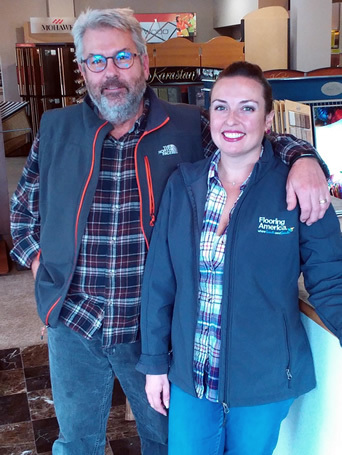 Today the store is managed by the father-daughter team of Ilaria Heiderich and her father Jim, and other family members are integral to the Seattle flooring showroom’s daily operation. Our carpet technicians are experts in the installation of plush, frieze, and Berber carpet, in all patterns, fibers and eco-friendly wools. Our hard-surface craftsmen are Marmoleum-certified trained experts in the installation of the new glass-backed sheet vinyl and Luxury Vinyl Tile. Our journeyman tile setters are trained in all Tile Council of America techniques and are experts with any material, from glass to stone. Our Bona-certified hardwood craftsmen take more than 40 hours of continuing education classes a year to keep up with advances in nontoxic, dust-free finishes; equipment technology; and application techniques. We are insurance loss experts and have experience working with all major insurance companies, which enables us to provide assistance with any claim. We are experienced experts who use the same estimating software and industry procedures that the major carriers use, which enables us to ensure that you get your floors and your life back to normal as soon as possible. As part of America's leading flooring retail group, Flooring America’s nationwide buying power guarantees you low prices on thousands of carpet types and other flooring options. Flooring America of Seattle is happy to provide you with free in-home design and estimating services to get you started. With more than 30,000 products in our beautiful showroom near University Village, come in and have a cup of coffee while you browse for the perfect product. Our entire team looks forward to serving you today!